When you first signed up for Facebook, you had the option to fill in a "relationship status" - this information is used on your public Facebook profile to let others know that you are "Single", "In a relationship", "Engaged", "Married", "In an open relationship", "Widowed", or "It's complicated"! Since things evolve, you will find yourself having to change or update your Facebook relationship status: this tutorial explains how to do this, how to show or hide your relationship status from other Facebook users (public, private, for friends only, etc. ), and if you can do so without other people knowing (anyone, or Facebook users in particular). Can you change your relationship status without people / anyone knowing? The first dropdown menu, labeled "Relationship Status", allows you to change your Facebook relationship status to one of the options mentioned earlier. Pick the best description for your current relationship status, and Facebook will ask you to (optionally) enter another user for this relationship, and an anniversary date. To apply the new relationship, click on the "Save Changes" button . 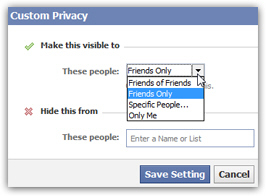 You can make your relationship status visible to "Everyone", "Friends of Friends", "Friends Only" — from most public to most private. The top part lets you make your relationship status visible to only a certain group of people: either pick "Only Me" to hide your relationship status from all but yourself, or choose "Specific People" to pick those (like close friends) who will be allowed to view your relationship status. Use the "Make this visible to" and "Hide this from" to find the perfect level of privacy you want for your Facebook relationship status! As you saw in the previous section, Facebook lets you customize the privacy and visibility of your relationship status: when you change relationship status, all these people will be able to see the new, updated relationship status if they go to your Facebook profile. Other than the person you optionally add as member in your relationship, other Facebook users won't receive a notice, even the former relationship partner.